I've always wondered what the difference between sakura and ume blossoms was. Is it the number of petals? If you mean how they're depicted, it's more the shape. Plum blossoms tend to be shown with very round petals, while the cherry is most often shown with heart shaped or at least cleft petals. Perhaps on a kimono for a specific season there would only be one kind of flower. 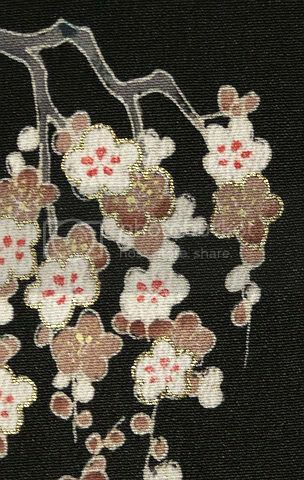 Sakura bloom in the spring, so that's a popular kimono decoration for spring kimono. I think ume are used a lot for kimono worn around the new year... *goes off to check her books* Or in Febuary...is that when the Japanese new year used to be celebrated? Basically, as kugepoet was saying, petal shape is key. If the petals are all round, then it's most likely an ume blossom. If the petal is heart-shaped then it's probably sakura. Ume has an earlier blooming season - February to March in Japan. Sakura is late March to April. Prior to the Meiji period, the Japanese used the same lunar calendar the Chinese did, so associating the plum flower with the New Year makes sense to me. Huh. In Seattle the cherry trees blossom in about February. So they bloom later in Japan? When should I wear a sakura kimono then? In February when they bloom in Seattle or in March when they bloom in Japan? When should I wear a sakura kimono in Missoula? I haven't seen any cherry trees since I got here, and so I have no idea when they would bloom here. This is definitely a case of having to use your own interpretation of when the right season is. Which is why I'm putting the finishing touches on a kosode in defiantly spring-like colors to wear to the Arizona desert next week. Deep breath. Let it out. You are not in Japan. You're in Montana. It'll be OK. If the weather is telling you "spring" it's all good. Remember, somebody had to observe what nature was doing in order for it all to get carved in stone as it now seems to be. - Ume (plum blossoms) are usually shown on the bough. When this is the case, the branches of plum trees are depicted as being very rough, of irregular thickness, and generally jagged looking (at least, in comparison to cherry trees). - Sakura (cherry blossoms) are often shown on their own, without the branches. When the branches are shown, they are usually depicted as being slender and graceful. Also, there is a particular depiction of sakura blossoms blooming vertically on willow-like branches; I think this design is called sakura-yanagi or "cherry/willow". This really is a dead giveaway because there is no "ume-yanagi". - Sakura are usually shown in one colour - pink - or sometimes in two shades of pink. Ume are often shown in two colours, white and red (or white and pink). There is generally more contrast with the ume blossoms. 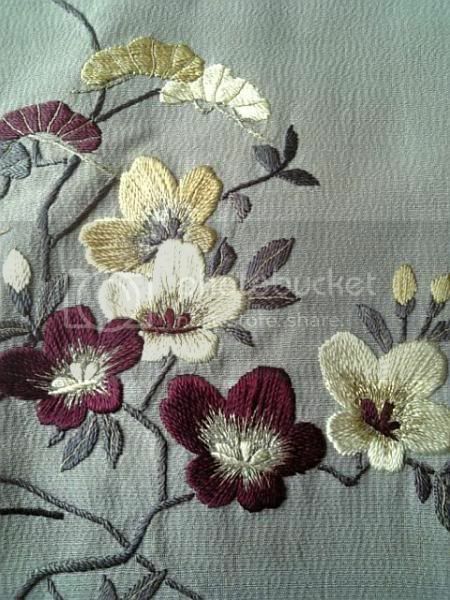 - If the flower design is abstract, sometimes the petals will be shown in a twirling fashion. This is the nejiri-ume or "twisted plum" design. (You see it sometimes on vintage meisen kimono and haori.) There is no "twisted cherry" design, so again this is a giveaway for identification. I've been thinking a lot about this because in my town, we have masses of plum (prunus) and cherry trees that come out over a period of 2-3 months in the spring. It can sometimes be difficult to tell them apart. Some of the plum blossoms have a cleft in them, which as kugepoet says is how cherry blossoms are always depicted... so in real life, the distinction is much harder to make! Aaaahh so good I found this old thread! I've been quite confused about the difference of ume and sakura myself. I myself have a fabric with a similar design, and it's Western so it can't be used as a reliable source the branches are highly stylised, "wavy" and slender, and quite long vertically. But, of course, I don't know where exactly they copied it from and how "truthfully". In any case, are these nevertheless ume, not sakura? Somewhere I read a little blurb about the difference between sakura and ume in Japanese art... "For cherry, the blossom, for plum, the branch." (or something like that) So, if the branches don't all but disappear into the background, it's probably ume, unless there are obviously hear-shaped petals sakura petals. Also, I've never seen ume depicted with blowing petals, so that's another clue. Shinobu yes, these are definitely ume. The petals are rounded and the thick branches quite visible. Also, most tellingly, the blossoms are blood-red. I have never seen bright-red sakura. Deep pink, maybe, but never TRUE red. Hi, it's naff to reply to myself, but I thought I'd illustrate the appearance of ume by showing some teabowls (chawan) that are decorated with the ume motif. And now, for contrast, some sakura. Shinobu, I found a couple of other sakura chawan (teabowls) that seem to test the rule just a little bit. So I thought it would be fun to look at them. Some of the sakura blossoms are a very deep coral-pink. Very close to red, isn't it? But the notching of the petals makes it clear these are sakura. What's interesting here is that you can actually see quite a lot of the branches on which the blossoms grow. These aren't the heavy, jagged, often horizontal or diagonal boughs shown with ume blossoms, however. These branches are simple, straight-down lines, almost sakura-yanagi style (with the sakura blossoms hanging down on willow-like branches). So, sometimes the distinction isn't super-obvious. I really like these marginal examples, though. They help point up the differences more clearly! Edited to add: The image name of the second teabowl is sidarezakura, or shidare-zakura. I looked it up just now and discovered that shidare means "weeping" ("a variety of cherry tree with drooping branches"), as in weeping willow; so shidare-zakura = weeping sakura. 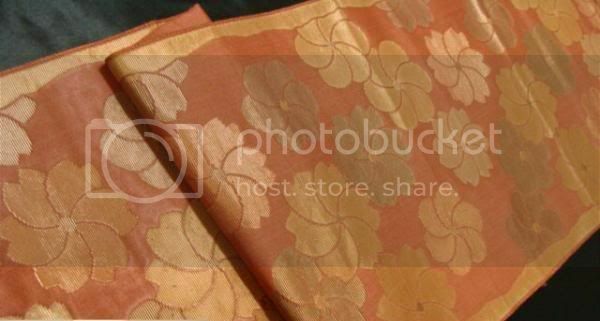 Finally I found out what this cherry motif is called - yay! 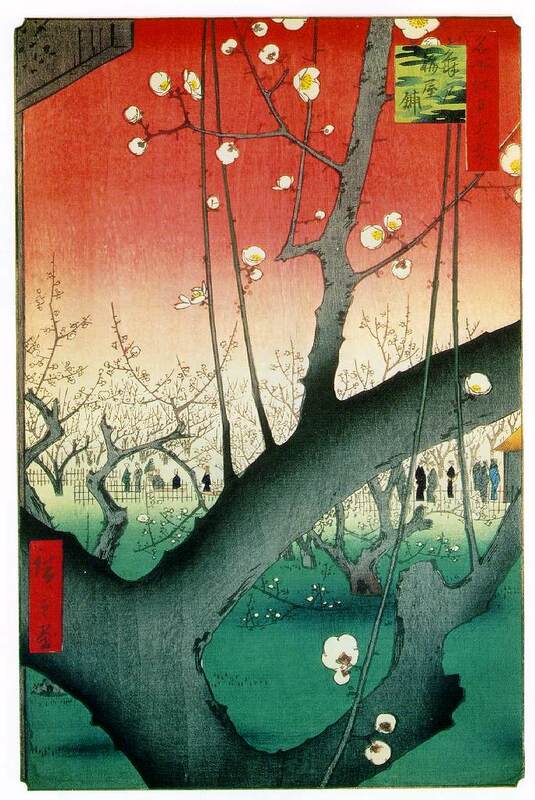 chamekke wrote: This is the nejiri-ume or "twisted plum" design. (You see it sometimes on vintage meisen kimono and haori.) There is no "twisted cherry" design, so again this is a giveaway for identification. 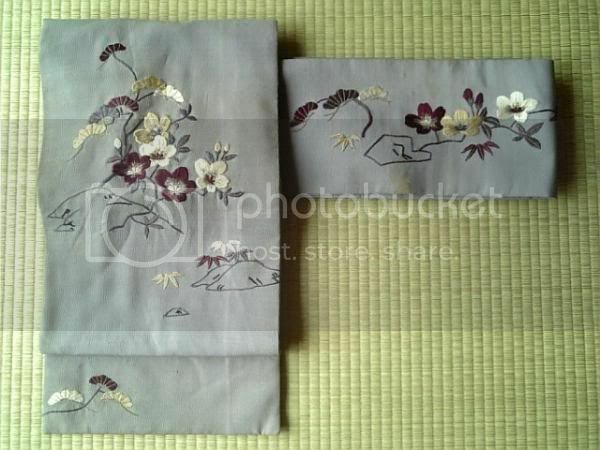 Yesterday I saw this obi at YJA; some flowers are clearly "twisted plum" but others looks like "twisted cherry". What do you think? I have never seen this pattern before. Sakura and ume combinations are actually pretty common, so I don't think that obi is all that unusual. It makes sense to have a consistent design style. I'd say that's a good obi for late winter and early spring. 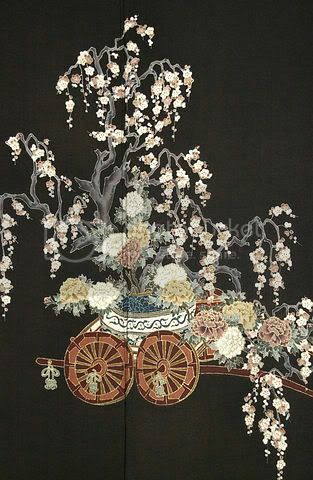 chamekke wrote: Also, there is a particular depiction of sakura blossoms blooming vertically on willow-like branches; I think this design is called sakura-yanagi or "cherry/willow". This really is a dead giveaway because there is no "ume-yanagi". Just a thought re: possibility of ume with notched petals. I've found the Chinese occasionally seem draw the ume with slightly notched petals, too...I have a Chinese fan, just a tourist kind, with blossoming plum not dissimilar to that on that origami paper - with petals clearly notched, although in a "rounded" way if you see what I mean. So, if they really are occasionally drawn with notched petals in China...maybe they're not completely impossible in Japan, either? :??? : I do find they usually have rounded petals in Chinese depictions, too. By the way, apparently "ume" is sometimes translated as "plum" into English, sometimes as "Japanese apricot" or something? There is also a third flower that blooms very early in spring and resebles cherry and Japanese plum blossoms: the Japanese apricot, momo. Here are some pics for comparison. The first row is sakura, then momo, and the last row is ume. It is easier to distinguish between the flowers if you see more than just the petals as cherry blossoms bloom at the end of an individual "stem" that branches off a real branch. Ume and momo do not, they form their buds directly on the branch. Comparing ume and momo petals we find that ume petals are rounder in form while momo taper a bit towards the middle of the blossom. It is hard to tell, though, especially from a photograph. Thanks for posting that comparison, Hanami! I think "momo" is also translated as peach... so those must be the blossoms that the elusive "peach blossom" kanzashi are made to represent. Mmm...those are momo fruit. Momo no hana (according to the mon book I have) look exactly like ume and sakura, except that they have pointed petals. The angles of the points are about 72 degrees, so the overall effect is sort of pentagonal. I'll post a pic if I can find one. These have more sharply notched petals than some of the other examples of "non-standard" ume in this thread, but not all the petals are notched. I did find a page with a picture of actual "yellow ume" here, so such a thing does exist, although it seems that it's not a "true ume". The page says they are called roubai (蝋梅). I found a Japanese Wikipedia page about roubai (here's the translation). It seems to suggest either that roubai is often found near ume, or is mistaken for it - I'm not sure which. P.S. The two kanji for roubai seem to mean "wax" (waxy?) and "plum" respectively, so it's definitely called a plum in Japanese at least.